There is a herd of progeny from Somebeachsomewhere on the tracks this season. The incredible beast that paced a hole in a lot of winds and retired to stud after a monstrous sophomore season, winning $2.4 million and taking a mark of 1:46.4, presents the cream of his crop, Captaintreacherous, in the $1-million Metro Stakes on Sept. 1 at Mohawk. His sire and the sire of his sire (Mach Three) won Metros but cannot bequeath a victory to this colt. He will have to earn it himself and it seems likely he will do that with the best legacy his sire and grandsire offer—speed. The freshman has already clocked two sub-1:50 wins and did those miles on his own, that is, without an opportunist trip behind another speedball. Can Captaintreacherous break the world record set by Sweet Lou in the Breeders Crown last year? That was a 1:49 mile at Woodbine. It would only be a footnote to what appears to be a colt far superior to “Lou.” He comes into the Metro for trainer Tony Alagna with four wins and one second and a bankroll of $242,078. It is still too early to tag the “Captain” with super-horse status but he is under great pressure to continue his ravage through the division. 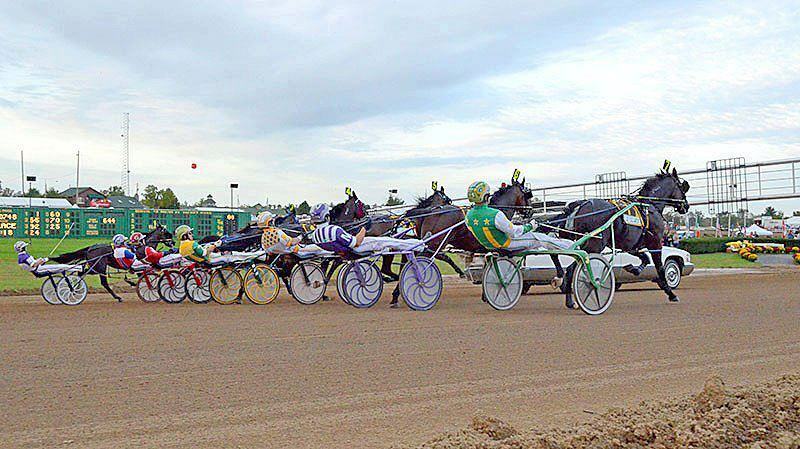 Also on the docket this weekend is the She’s A Great Lady Final for the frosh filly pacers; the Canadian Pacing Derby Final for the FFA pacing crew; a lot of Pennsylvania Sires Stakes at Pocono; and Grand Circuit Champlain and Simcoe stakes also on the Mohawk program. Captaintreacherous headlines a field of 10, with an also-eligible (Wake Up Peter) drawing in Mohawk Aug. 25 program. Let’s look at the elims. Another Alagna student, Rockmyjeans, has been scratched. He finished in an elim behind Apprentice Hanover and Vegas Vacation. The move is simple: pass or go exotic. For exactas key Captaintreacherous with the highest outsiders’ odds. Exactas won’t be worth much with second or third choices, so look for big numbers with all from the 5 post up. Trifectas, of course, are tougher but if you go for it, use the same horses on the outside in some combination based on odds. The Metro Consolation is worth $100,000 and it gathers horses that would rarely show up in a race of this purse caliber. But here they are, a ragged bunch of also-paced from the Metro Stakes elims. We have no idea which horse will get the final push at the windows but we are going to stick with Teresa Beach, who was horrible in his elim. I think this is a developing son of Somebeachsomewhere that needs this kind of field to show improvement and will do so at a great price—if the crowd doesn’t back him due to his driver, the every-popular Brian Sears. The frosh-filly pacers meet in the She’s A Great Lady Final on Sept. 1 and unlike the Metro situation, the horse projected to be most favored seems rife for defeat. We can beat I Luv The Nitelife and L Dees Lioness with the developing filly from post 8, Macharoundtheclock. With a little luck the two probable choices will be in a battle for the lead and this speed-bred baby will be in a ground-saving position stalking and raring to upset with a big, late move. Jody Jamieson is up and although we rarely use drivers as positives for our choices, he is a great “money driver” and knows how to maneuver a horse like this, even up against blaring speed. Betterthancheddar, only four, is looking to topple older pacers the same way he did last week in the Canadian Pacing Derby elim. The $787,000 final is his target on the first day of September at Mohawk. This week, however, he has to face Golden Receiver and Foiled Again, both given byes to be in the final, missing last week’s adventure in “Cheddar,” so to speak. The others are ones he defeated last week but adding Golden Receiver and Foiled Again to the field could make for more foes for Cheddar to grab the bulk of Canadian dollars. Among the outsider contenders, which on any other night might be choices, are We Will See, Bettor Sweet and Arachche Hanover. 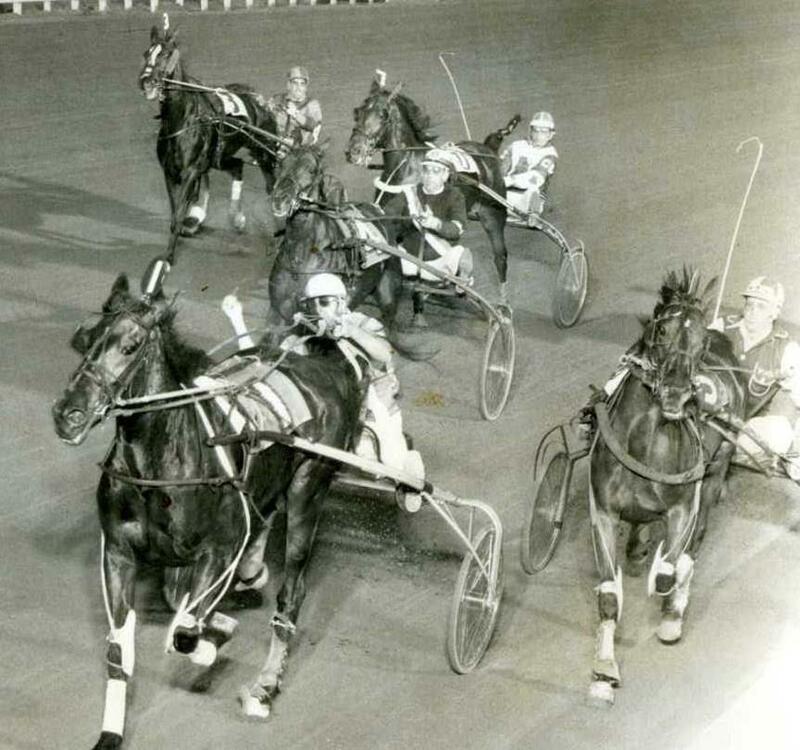 Hypnotic Blue Chip, Alsace Hanover, St Elmo Hero and Sparky Mark make up the rest of the traffic. Golden Receiver is at the top of his game and will try to gun these foes. Cheddar will be looking for a trip, hoping that St Elmo Hero, who showed remarkable improvement last week, and Bettor Sweet will provide live cover before his move. If there is a shuffle as opposed to a flow in this mile, look out for We Will See. The fact that We Will See has been less than powerful against this group for a spell, he is in the perfect spot from post 1 and can be driven courageously to give his best. That is what we have not seen lately from We Will See, so maybe Ron Pierce up can make us see We Will See at his best, where he is as good as any of these. My readers should see that I am being objective because this guy was not one of my favorites as a sophomore and his maturity proved that I was wrong about him at four. At five he still has much to offer and should go off even better than his morning-line 4-1. A Spring Of Hope is a four-year-old-and-up-pacing-mares event with a $100,000 purse offered for some top femmes. When push comes to pace, though, so to speak, Rebeca Bayama, who we gave you to win the Golden Girls and did just that, returns to home and is in the best shape of her elder campaign. You may get a price from post 8. The Hambletonian Society and TwinSpires continue to generate extra activity at the Breeders Crown Countdown, following prospective entries from all eight divisions in the classic events, scheduled to be presented again this year on a single card at Woodbine. Check the blog often for updates on great betting opportunities that don’t appear in the regular TwinSpires blog. This week, go to the blog for the Grand Circuit races, featuring Simcoes and Champlains with many “Crown-bound” beauties, and the Pennsylvania Sires Stakes finals. Like his sire and his sire before him, the genes of guts and heart, speed and stamina are on display again as soph-colt pacer A Rocknroll Dance takes on eight foes in the $322,716 Cane Pace Final on Monday, Sept. 3. Tioga Downs is the recent home of this event, long described as the first jewel in pacing’s much-ignored “triple crown.” This season the progeny of Rocknroll Hanover, which continues to an extraordinary winning beat once again has a star in the sophomore ranks. 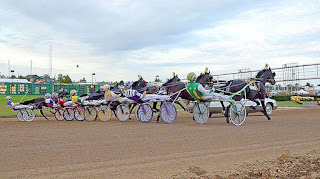 A Rocknroll Dance will start the steps of this mile from post 6 and from there he and driver Yannick Gingras will improvise the tempo in one more attempt to wind up in the winner’s circle in a major event for the division. A Rocknroll Dance is so dangerous in any field that he overshadows the “now” horse, Heston Blue Chip. 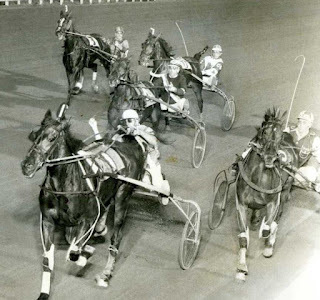 And, since that one has to negotiate the 9 hole, though he has the acumen to handle an outside post, he still has to deal with the “Dance.” Even Bolt The Duer, the colt that beat Dance in the Adios, getting to him by saving ground in an awesome three-quarters time of 1:19 (pressured by Sweet Lou), would tremble in this field. Dance received a bye to adorn the field in the final and that just gave him a little more time to take a breath before striking the match for another scorching mile. Time To Roll also comes to the field with a bye but Dance has left him in his wake before, rest or no rest. So this year’s Cane Pace analysis is merely an essay hiding in the giant shadow A Rocknroll Dance is casting. New York fans may put more money on “Heston” than he deserves and other bettors will swing for the fence with fingers crossed, wagering on any of the others for an upset, but this essay can only suggest the Dance as a key to second-and-third finishers that may combine for a small-paying trifecta. And those two elements, for sure, are coin tosses at best. In a footnote paragraph, the sister event to the Cane is the Shady Daisy for soph-filly pacers on the Cane program. In this short field for $100,000 you might find value again on Bettor B Lucky, who won at a huge price against the best in her division and who can again be overlooked considering the gals leaving from the first three posts.